....present friggin' Film Petit. Gosh. It's a good thing Hendrix was in a very foul mood for photos. His new anti-pictures stance is very Napoleon. Rex has always been one of my very favorite parts of this movie. I love everything about him. "Fugit about it!" I think I'll just fill this post with Rex gifs. No one would object to that, right? "You're gonna learn to discipline your image. You think I got where I am today by dressing like Peter Pan over here?" 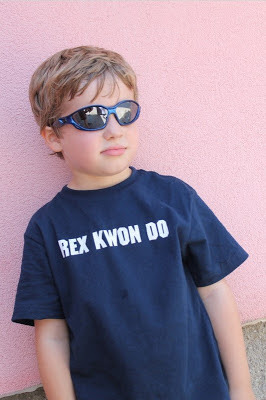 As hysterical as the roundhouse kick pants would have been, the kids needed summer play clothes. 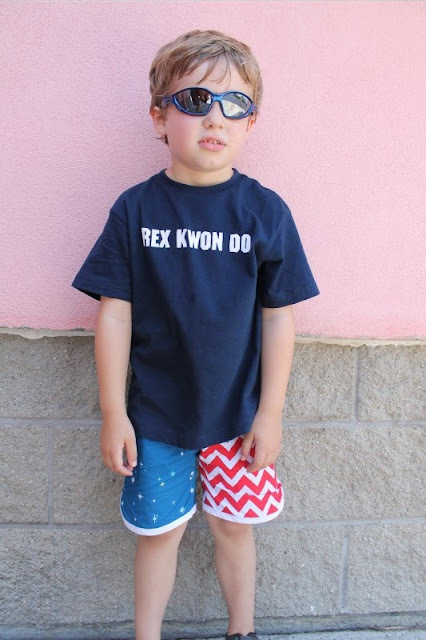 So Hendrix got the racer shorts version. I'm sure he could still roundhouse things in these though. I got to use a new pattern that will be released soon from Dana! 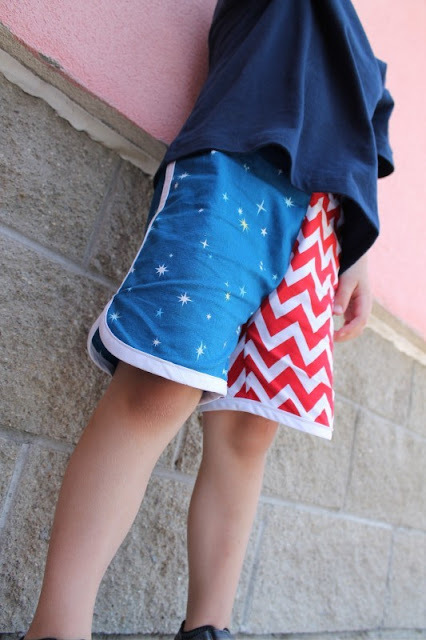 It's a great pattern, for girls and boys with lots of options. Keep an eye on Dana for its release. I used Lizzy House's Constellations fabric and Riley Blake chevrons from Sewn Studio. Elsie's kind of Kip from the waist down and Napoleon from the waist up. 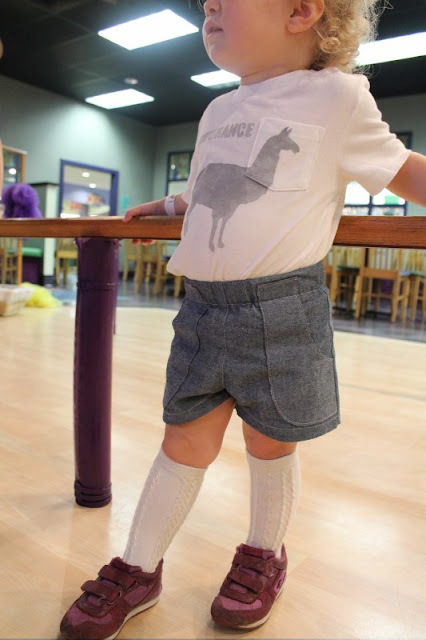 I made her shorts using Dana's same upcoming pattern and a very nice Robert Kaufman denim. So nice to sew with. I even put lion/ tiger fabric on the pocket linings, but forgot to take a picture! So, we're pretty much friends by now right? So you got my back and everything right? On my freezer-paper stenciled shirt, I changed the horse to a llama in honor of Tina. It's so quietly weird. Kinda like the movie. Even though it's not exactly cool anymore to go around dropping ND quotes, they are still just as hilarious as ever. I love it. Whoa you guys: to see how the pros do it, you have to spend some quality time with our beautiful guest Delia Creates today. WHOA. She is the one who made that awesome intro banner for us too- amazing!! 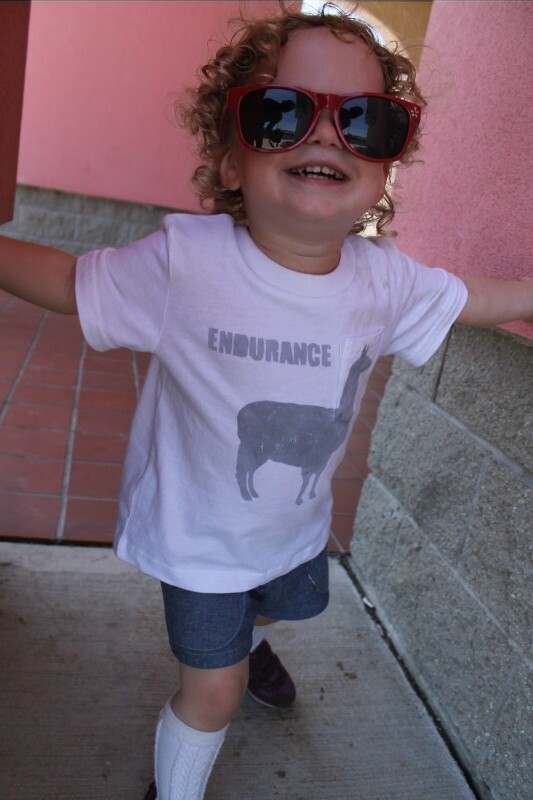 She made THE perfect Napoleon pants, plus hilarious tees and an adorable little Pedro outfit. And to top it off, she took pictures at the real setting of the movie! Delia has seriously been the sweetest most patient guest ever. Thank you for everything girl! Go now, it's friggin sweet. And Kristin perfectly recreated one of the most hilariously awkward scenes in any movie, let alone this one. Her little Deb and Rico are ADORABLE. See it at Skirt as Top. So that wraps up another edition of Film Petit. You can catch up on past installments here... I'm gonna go practice my sweet dance moves. I finished this quilt a few weeks ago and finally took pictures today. 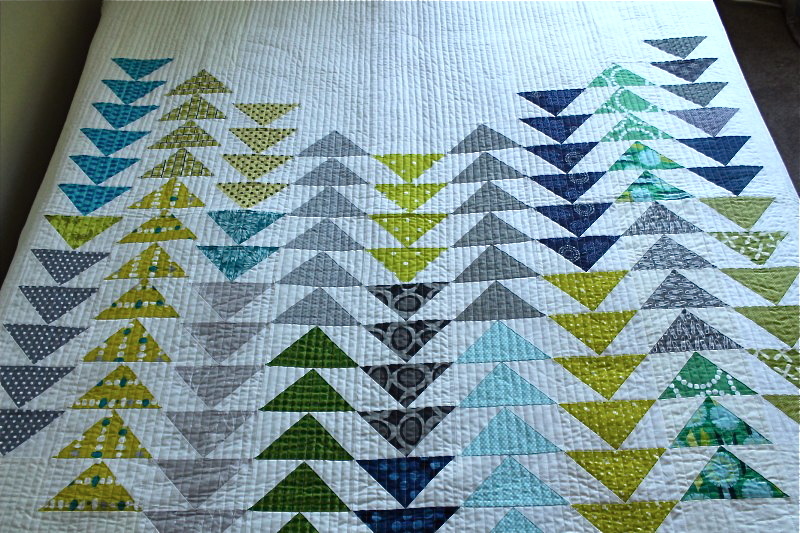 This is definitely my favorite DGS quilt yet! Do Good Stitches is a charity bee I've been in for nearly two years. 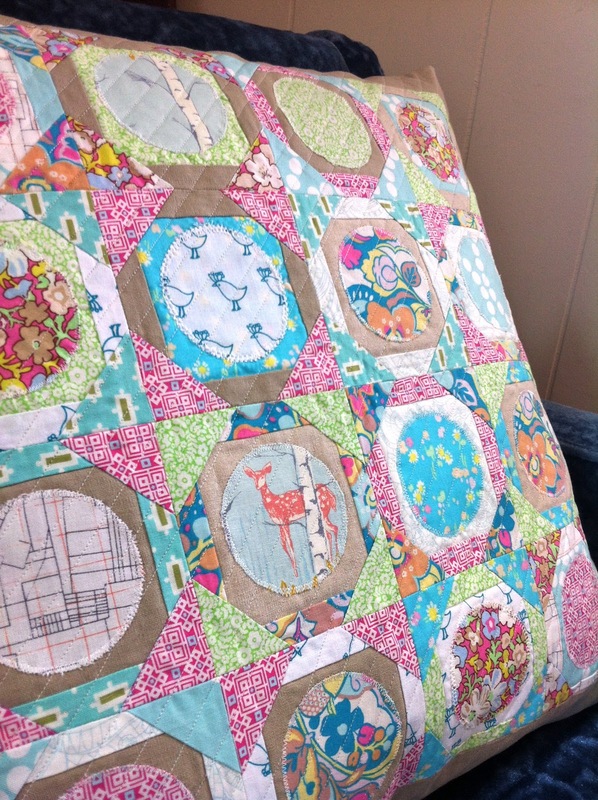 Every few months, I get to be the designer of the quilt my circle of the bee makes. 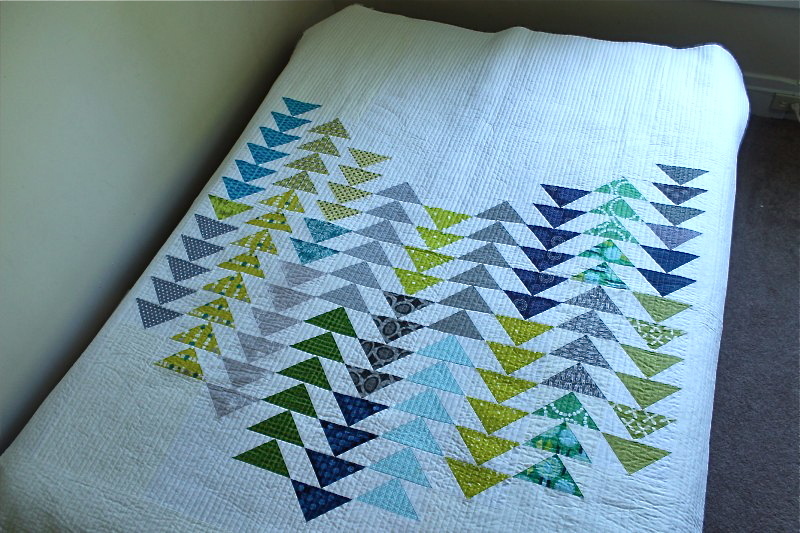 This one was inspired by my friend Andie's minimalist flying geese quilt, featured in her awesome book. Of course, mine couldn't be quite as minimalist as hers, or else my group wouldn't have had much sewing to do! Instead of the standard 2 12" blocks, I instructed everyone to send me a strip of 12 flying geese units all joined together going the same direction and on a white background. They each finish at 6" x 3". They matched those colors pretty perfectly right? 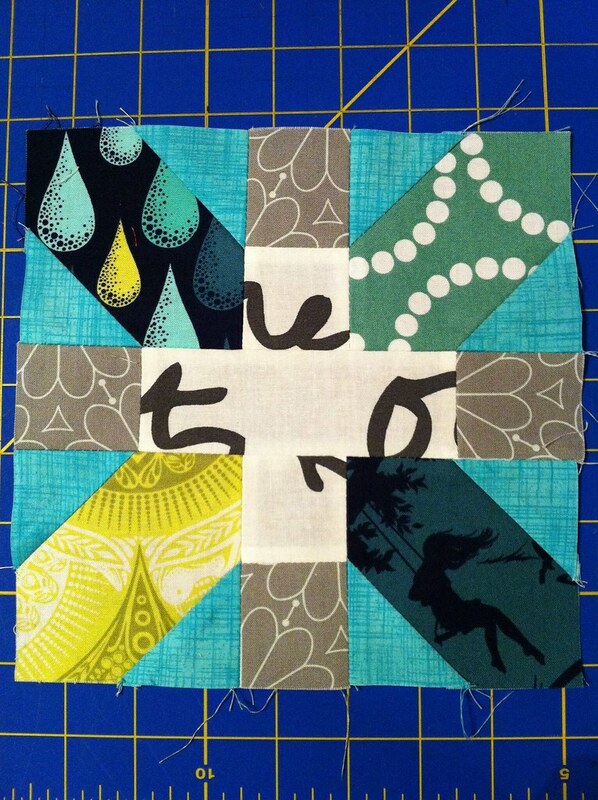 It's my most favorite block from my scrappy Japanese +&x quilt. 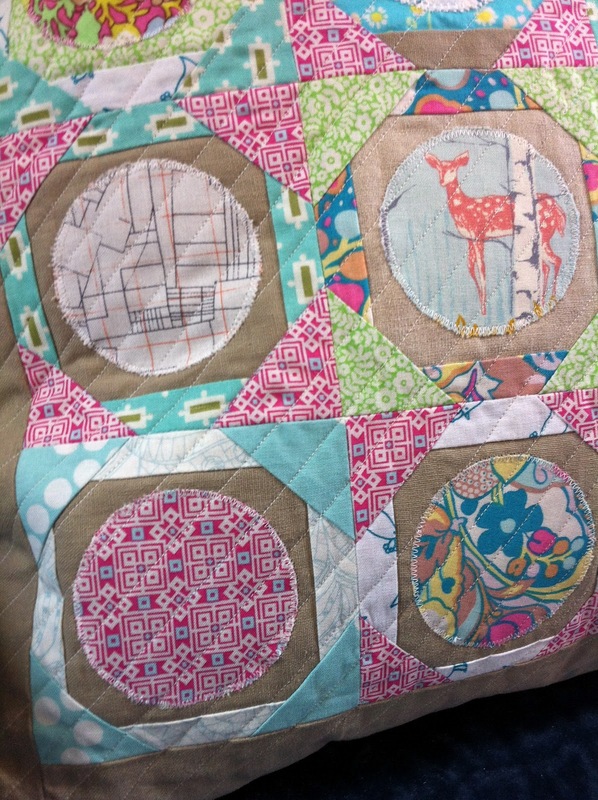 I did straight line quilting, vertically just like the geese, about 1/2" apart. 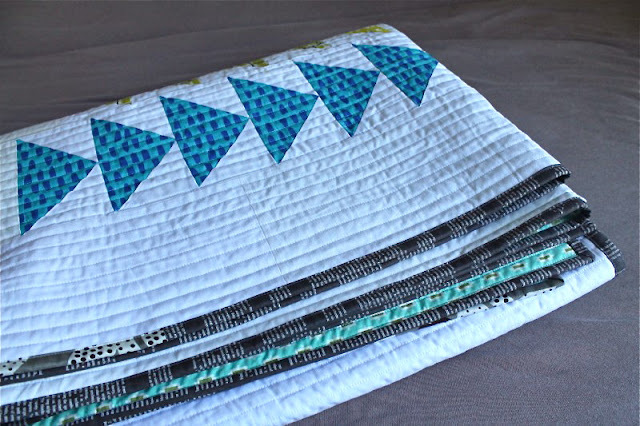 With all that white space, I knew I wanted to do heavy quilting. I think the simple straight lines are just perfect here. Always my favorite. The backing is all this pretty Vintage Modern print (Bonnie & Camille for Moda) from Sewn Studio on clearance. I just love the color. I didn't wash this quilt before taking pictures, which is the opposite of my norm. I just wanted the smooth look for pictures, but I'll definitely be giving it a good wash-n-crinkle before dropping it at Project Linus this week. It's a good thing, because I've already got most of the blocks in for my next do good quilt! I think most of us have a fabric comfort zone right? Most of it has to do with taste, but some of it has to do with confidence. Like sometimes, you might really like a certain type of fabric but you fear you might not have the skill to do it justice. Like it's too unfamiliar to wield it's power. So my partner likes things that are light and girly and pink and vintagey. I appreciate that a lot, but it's not my zone. I need edge and angles and contrast and some black in there somewhere. But that is what makes these things fun and stretching right? 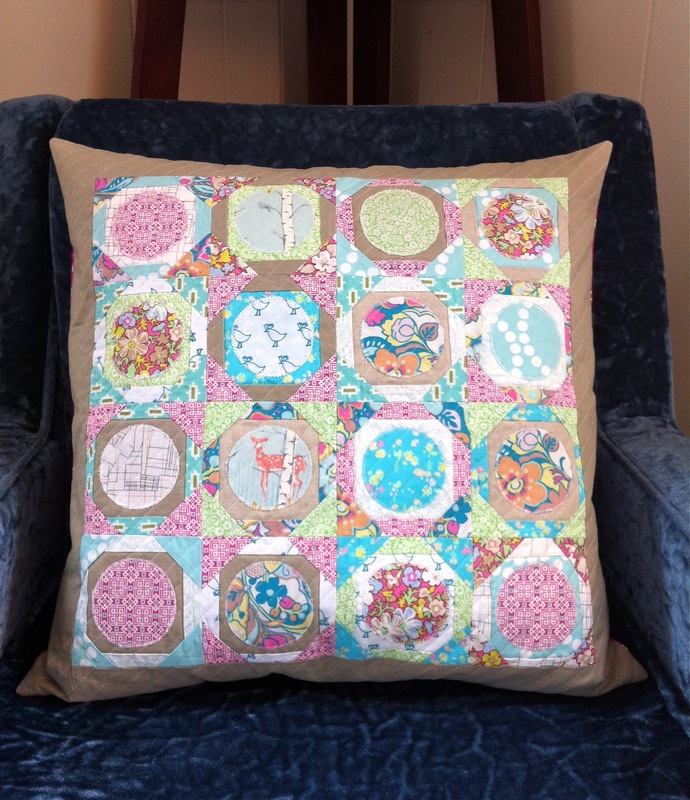 The pillow is made up of 16 little 4 inch "tea plate" blocks. At least I think that's what they are called. I saw them in a random quilt block book at the store one day and thought they had a great vintage look that would go with my fabric pull. Plus they seemed like they would lend themselves to playing with low-ish volumes and a bit of linen. I don't normally go for something involving appliqué anything, but it really wasn't that painful. 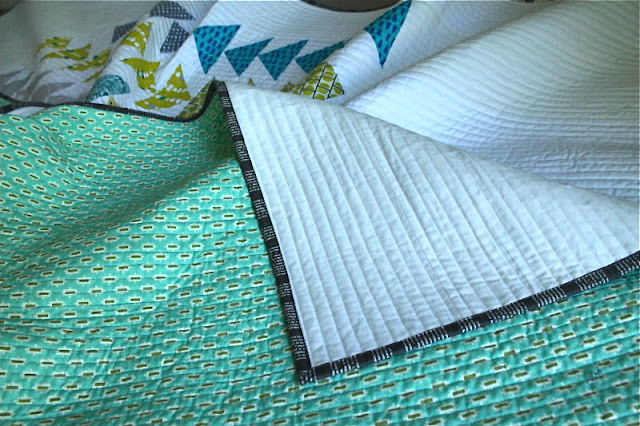 I added one linen border and quilted with close together straight lines on the di-ag. 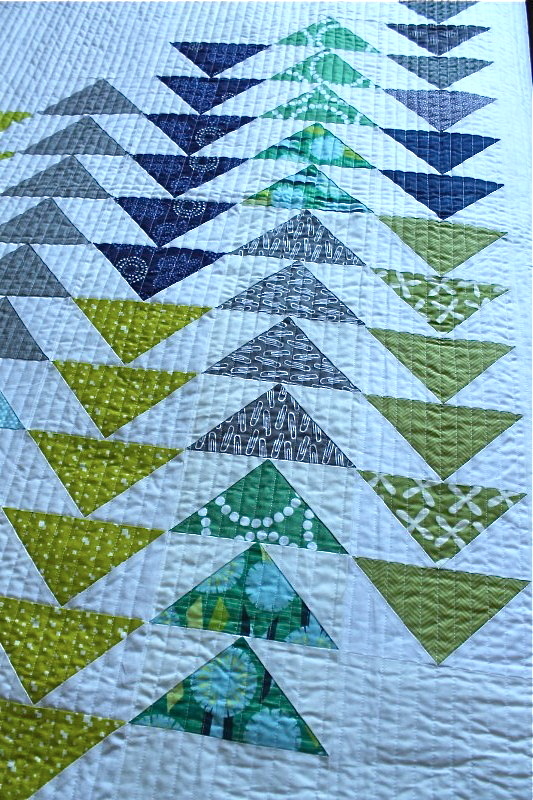 That quilting is definitely my zone. I had to hang on to one shred of stubbornness here. So although this was one of those projects that had me wondering if my choices would actually work out the whole way through, I think most of them did. I'm happy that I made something I like even though it isn't something I ever would have made for myself. But most importantly, I think my partner might love it and I really hope she does. It's on its way now! This is the new project I'm working on now. Simple block, scrappy, all circles and geometrics, with a limited color scheme involving brights with some gray and black. That is totally my zone. It's funny because someone commented on this IG picture (I'm @alittlegressica there) that they were "glad to see me back" because that pillow cover I had been posting had them a little worried. 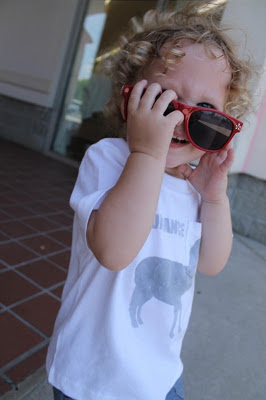 I kind of love that, because it means to them I have a certain style. Sometimes it's hard to see that in yourself, but I'm seeing it now. I don't think that person was being mean about the pillow, it's just not something they expected from me. It's a very nice compliment. So just to make sure I'm not a crazy person, could you tell me about your fabric zone? And what's the type/line/substrate/designer of fabric you might like, but are also slightly afraid of being clumsy with?